The US car companies often get dinged for being behind the technology curve when it comes to engine technology. Fords Ecoboost program really closes that gap. 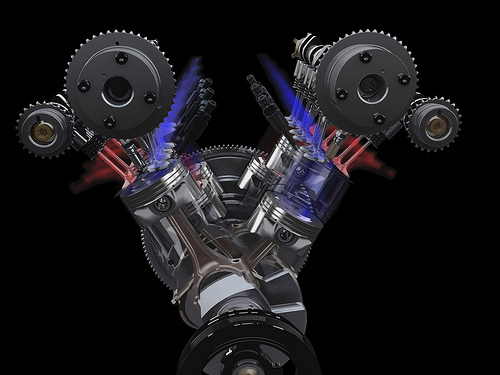 Ecoboost is “Ford-Speak” for turbo-charged direct injection engine technology. The 3.5 liter (in the Ford Taurus SHO, Ford Flex and Lincoln MKT) also has variable intake valve technology. The end result is a 3.5 liter engine that makes 365 HP, about 104 hp/l. Quite nice indeed. 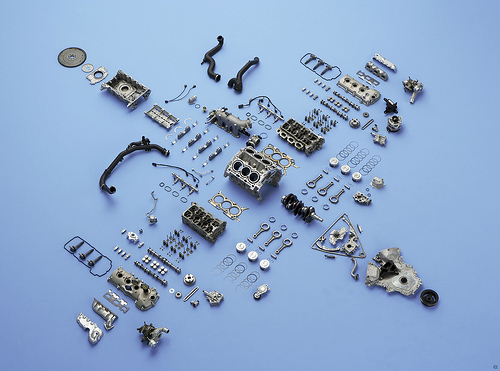 All the parts (except fasteners) of the new Ecoboost 3.5 liter twin turbo direct injection engine. Photo from Ford Motor Co.
Development resulted in new piston crown and combustion chamber design that will show up all over Ford engine offerings. What’s really cool about this is that the gas mileage is barely different than the normally aspirated 3.5 motor. In the Taurus SHO city MPG drops from 18 to 17 mpg, and highway drops from 28 to 25. And this is with a ~275 heavier car with AWD, so a lot of that difference can be attributed to drive-train loses. 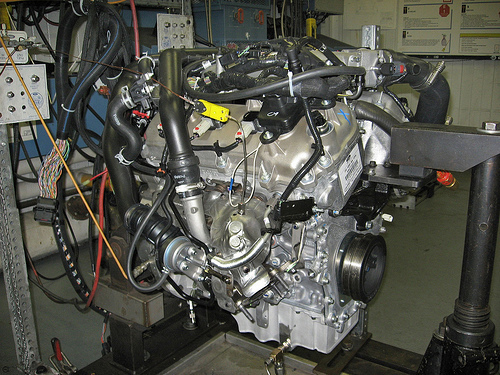 Ecoboost 3.5 on a test stand. Photo courtesy Ford Motor Co.
Now, the turbos used from the factory are small Honeywell units chosen to minimize turbo lag. Just wait till the aftermarket gets their hands on this and comes up with some upgrade kits. This should be a real screamer! Computer Rendering of the 3.5 intake stroke. Photo from Ford Motor Co.
And the domestics are a lot more supportive of aftermarket ECU modification than the European companies like Mercedes, BMW and Audi. I can’t wait! and what is the towing limit. Final EPA numbers aren’t out yet, but the EcoBoost-equipped F-150 will tow 11,300 pounds. 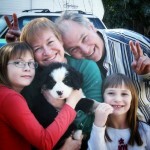 Current estimates are for about 15/21 MPG on the EPA cycle.